One matter of great concern immediately following the magnitude 7.9 Denali Fault earthquake in November 2002 was the fate of the Trans-Alaska Oil Pipeline, built in the 1970's. This vital lifeline transports about 17% of the domestic oil supply for the United States. At current prices, the value of oil flowing daily through the pipeline is about $25 million. To transport oil from Prudhoe Bay on the Arctic Ocean to the ice-free port of Valdez on the Gulf of Alaska, the pipeline had to cross the Denali Fault. 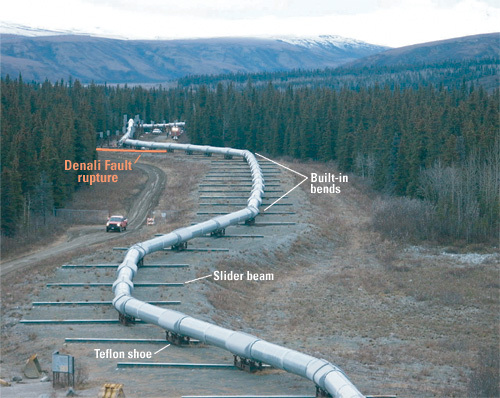 During the 2002 Denali Fault quake, the ground was offset beneath the pipeline, and violent shaking damaged a few of the pipeline's supports near the fault, but the pipeline did not break. The survival of the pipeline in the Denali Fault earthquake was the result of careful engineering to meet stringent earthquake design specifications based on geologic studies done in the early 1970's by the U.S. Geological Survey, Woodward-Lundgren and Associates, and others in conjunction with the Alyeska Pipeline Service Company. Those studies located the Denali Fault within a 1,900-foot corridor crossing the pipeline route and estimated that the pipeline could be subjected to a magnitude 8.0 earthquake in which the ground might slip 20 feet horizontally and 5 feet vertically. These estimates proved to be remarkably accurate for the 2002 magnitude 7.9 earthquake, in which the rupture crossed the pipeline within the 1,900-foot corridor, and the fault shifted about 14 feet horizontally and 2.5 feet vertically. To accommodate the projected fault movement and intense earthquake shaking from a magnitude 8.0 quake, the zigzagging Trans-Alaska Oil Pipeline, where it crosses the Denali Fault, is supported on Teflon shoes that are free to slide on long horizontal steel beams. Such creative engineering solutions used in the pipeline design and the studies that led to them cost only about $3 million when they were done in the 1970's. Had the pipeline ruptured in the Denali Fault quake, the lost revenue and the cost of repair and environmental cleanup could have easily exceeded $100 million, perhaps many times.